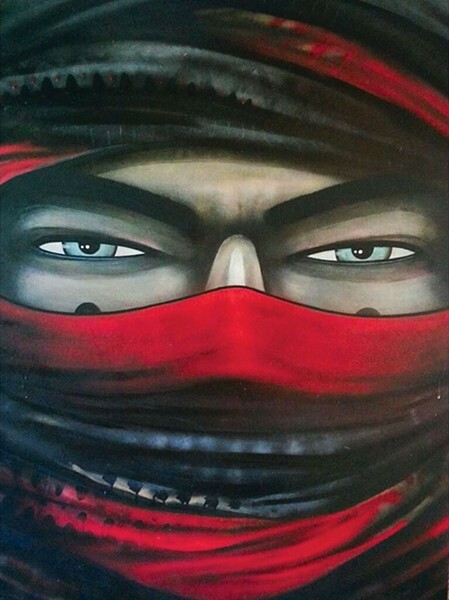 In recent years, "street art"—graffiti on the sides of buildings, street murals and other urban art forms—has risen to the status of fine art, with the emergence of magazines like Los Angeles-based Juxtapoz and others that celebrate works by "outsider," non-academic artists. 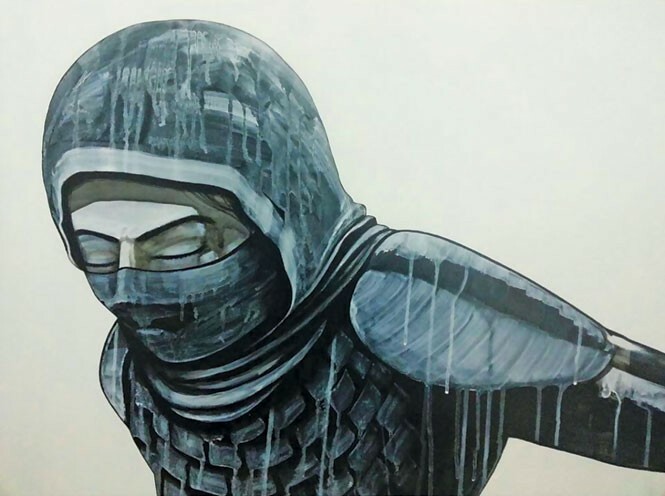 One local street artist to emerge on the scene is Casey Kawaguchi, who is opening a solo show at FICE clothing boutique. "I've been drawing and creating art since before I can remember," recalls Kawaguchi, a 31-year old Northern Utah native. "It's just what I've always loved and, for whatever reason, believed I was good at. I grew up drawing a lot of ninjas and superheroes. A lot of those characters are similar to stuff I'm painting today." Artists in the 1980s, like Jean-Michel Basquiat, often drew in a primitivist street-art style, but Kawaguchi's work is more polished, mixing spray cans and the good old-fashioned paintbrush. His work is also inflected with the traditional aesthetics of Japanese portraiture, samurai imagery and superhero subculture. The combination creates a sense of drama and intrigue. "My style has been evolving ever since I started making artwork," he says. "I'm half Japanese, and Japanese culture and imagery have always been a big influence on my art. I'm also inspired by many other artists and their work." In addition to making a splash in galleries, artists like Kawaguchi have pushed the commercial aspects of their work, and haven't had a problem with blurring the boundaries between fine art and product design. Kawaguchi was chosen by the artist Saber to be featured as a finalist in a Juxtapoz art contest, and has had his designs utilized by several sporting-good companies. "The Juxtapoz deal was cool, 'cause it was so unexpected," he says. "And having my artwork chosen by an artist I admire such as Saber was a big compliment. "The collaborations I've done with different companies have been fun," he continues. "Last year, I designed a pair of skis for 4FRNT Skis called the 'Madonna' that won the Editor's Choice Award for Freeskier Magazine. They gave me a huge amount of freedom with the project, and I was really happy with how the skis came out." With all the success of these collaborations, he still finds a lot of enjoyment in what he calls "random acts of art," like making stickers and tucking them into publications around town. It's a way of carrying on the prankster tradition of street art without the vandalism—the "leaving a mark" ethos of graffiti taggers that, instead of being destructive, is a kind of gift. His work also plays with the temporary nature of street art, sometimes distressed by natural elements but always possessing a certain elegance and serenity that lifts it above bulk street art. His solo exhibit at FICE shows how far his work has progressed since his early drawings and first shows. "I'm stoked to be having my first solo show," he says. "I've worked very hard to make this show happen, and now that it's here, I feel a big sense of accomplishment." It's an assertive artistic statement. "I titled the show State of the Art," Kawaguchi says, "because these paintings are that: the state of my art at this point in my life. I did almost all the pieces in the show over the last two months. This show and this work represent me." FICE owner Corey Bullough has featured nationally renowned art world heavyweights like NYC photographer Ricky Powell, but he's also shown a lot of locals, and is excited to give Kawaguchi exposure. "I've seen his stuff around for a few years now, I've always been a fan of his subjects and his color palette," Bullough says. "I think, in the last year or two he's really been honing in on his gift. He's got a great career in front of him and I'm honored to help him hang his first solo show."